The freedom of speech is a pillar of our democratic process...it’s supposed to welcome all voices. But what happens those voices sow hate, or threaten to hijack the political process? That’s what the Richmond City Council is grappling with right now. The council has a deep ideological divide. On one side, there’s the more established, moderate business faction. And on the other, members of the newer Richmond Progressive Alliance, or RPA. For months, Councilwoman Jovanka Beckles -- who is openly gay and a member of the RPA -- has been subjected to personal attacks about her sexual orientation during public comment. Some people say the constitutional right to free speech means they can say what they want. But Beckles and her supporters say it’s hate speech -- and it’s not protected. The city is working to restore order to the meetings. At a Richmond City Council meeting on September 16th, people in the audience hold signs against hate speech, and homophobia. Richmond resident and city council meeting regular Mark Wassberg goes to the podium for public comment. That’s when Mayor Gayle McLaughlin cuts him off. “All right,” says McLaughlin as Wassberg yells that he has a constitutional right to keep speaking. By this time, only about two dozen people remain. The chambers were packed three hours earlier, when 50 people spoke during the open public forum. This exchange between Mark Wassberg and Gayle McLaughlin at the September 16th meeting is par for the course. But the unruly behavior isn’t just from the audience. It’s also coming from the City Council itself. Like at a May meeting, where Jovanka Beckles had to defend her Nigerian-style headwrap and is interrupted by councilmembers Corky Booze and Nat Bates. “It is frequently like a circus,” says Robert Smith who teaches political science at San Francisco State. He has followed Richmond politics for years, and regularly watches city council meetings. He says a deepening ideological divide is exacerbating the situation. Smith says certain councilmembers are instigators in the situation, leading by bad example. Those members have deflected criticism blaming the mayor in some media coverage for not being in control. Whatever the councilmembers’ role, the audience still acts as a disruptive force during meetings. Back in June, the city council considered barring continually disruptive people for six months. The city attorney said that probably wasn’t legal under the First Amendment. So the council asked city staff to come back with some proposals that are constitutional. On September 16th, City Attorney Bruce Goodmiller reported back that they consulted with attorneys around the state as well as the American Civil Liberties Union. “We looked for the most defensible, the most -- I will say -- appropriate and strong measures statewide that could be defended,” Goodmiller told the council. 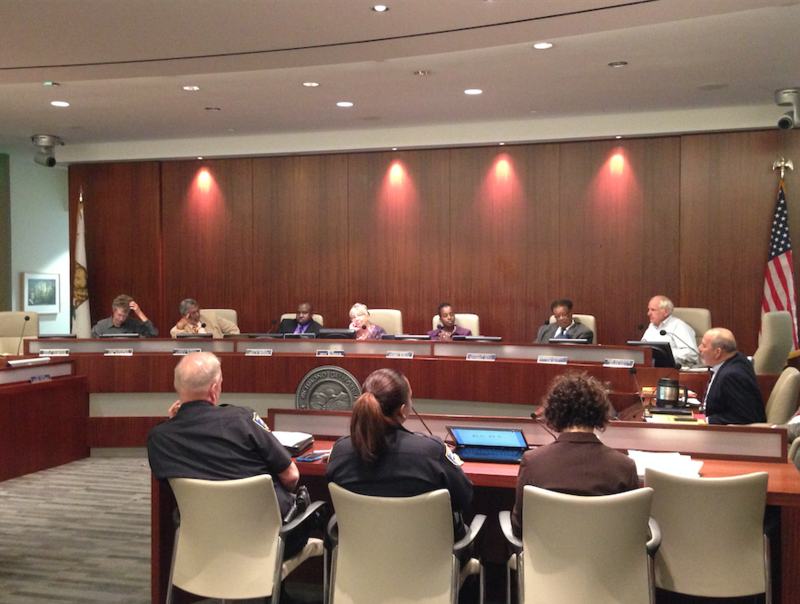 Legally, a city council can limit speech in a meeting, if it becomes disruptive. That’s because the courts have decided a city council meeting is a “limited public forum” -- with fewer protections than a traditional public forum, like a street corner or a public park, to make sure city business gets done. Goodmiller says staff took that into account. Staff proposed five options including a reminder about the rules before every meeting and allowing councilmembers to excuse themselves if they feel offended. San Francisco, like many Bay Area towns, have similar rules on the books. City councils around the country have grappled with this issue in recent years, from small towns in Florida to Costa Mesa in Southern California. The fact that other cities struggle with civility code doesn’t make it easier in Richmond. Public comment on the issue drew dozens, mostly in favor of limiting hate speech. Like Richmond resident Ben Barr. He’s the executive director of the Rainbow Center, which serves Contra Costa County’s LGBT community. 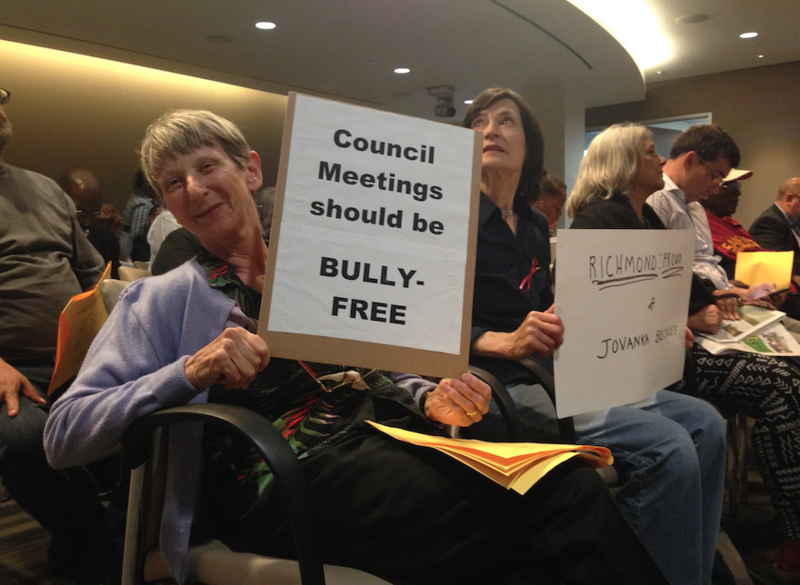 But Richmond resident Jackie Thompson doesn’t support new civility rules. Thompson is right. Richmond already has rules that govern city council meetings. They require that speakers at meetings “avoid indecorous language. And “those who interrupt the proceedings” can be barred from that day’s meeting. But those rules are not enough. So at the September 16th meeting, the Richmond City Council voted six to one to send the new proposals back to staff to finalize a more concrete set of civility rules -- something more enforceable. Staff is expected to report back this month. More than 400 people have filled Richmond’s Civic Auditorium. You can spot the Chevron workers. They’re wearing blue and white shirts saying “Richmond Proud” and waving signs that read “Modernize Now” – signs supplied by Chevron. For nearly a decade, Chevron and its neighbors in Richmond have been fighting over a proposal to retool the oil company’s refinery. Most everyone agrees the plant needs to be modernized. But they differ about how.